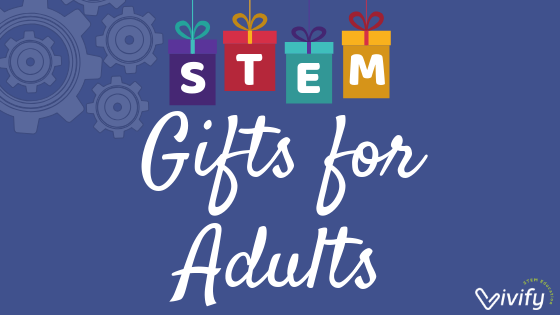 Tis the season for shopping for STEM gifts! Looking to score something fun and educational for your kids or great deals for your classroom? 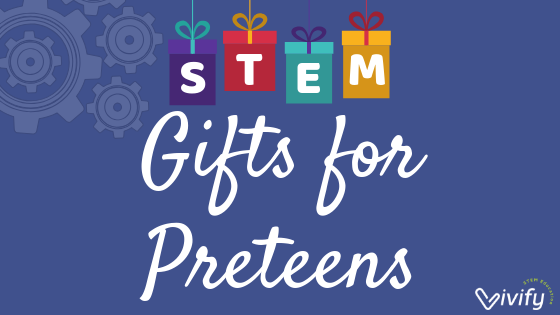 Read on for our favorite STEM toys and learning tools to add to your holiday wish list. Everything is sorted by age including some holiday treats for yourself! 1. Magnetic blocks- We love how magnetic blocks like Magformers or Tegus open up a world of creativity and improve spatial skills. I carry this set of Tegu blocks in a handy pouch in my purse to pull out when my kids become restless at restaurants or other outings. Always works to keep the peace! 3. Take-Apart Toys- Build creative problem solving skills with kits like this Set of 7 Take-Apart Toys from Kidtastic. Kids take apart and build back together their own toys like dinosaurs and trucks using toy screws and screw drivers. 4. Wonder Lab - The Little Tikes STEM Jr. Wonder Lab Toy with Experiments for Kids is an interactive design lab that comes with 20 experiments for your budding scientist to explore along with built in activities. This is a great start to a makerspace for your little one. 5. Robots - Bee-bots by Kaplan Early Learning and Learning Resources Code and Go Robot Mouse are great tools to introduce your preschooler to thinking like a programmer. Both of these robots are easy to learn and have applications that can grow with your little one into their early elementary years. 1. Osmo games - These are interactive games that are played with an iPad to teach basic coding skills. In the Coding with Awbie game, instead of just staring at a tablet, students manipulate physical game pieces that are sensed by the iPad to send commands to a character in the game. Additional games teach basic math skills or promote creative problem solving like the Genius Kit. We use Osmo at home for hours of fun with our own kids and recently added as a station at our STEM Family Nights. It's become one of the most popular activities! 2. Robotics - The classic STEM gift continues to get more advanced as more sophisticated robots come out each year. Our favorite is the Sphero Bolt (read about it in our post here- http://www.vivifystem.com/blog/spheroboltreview). It has many awesome features that can also grow with your child and be used at home or in the classroom. We also like Botly which is a great coding robot that is screen-free unlike Sphero robots which require use of an app or a smart device. 3. Circuit building - learn the basics of circuitry through play using Snap Circuits and their guided projects! LittleBits are another great option similar to Snap Circuits as they teach the basics of electronics through creating simple circuits to make a light or sound. However, these magnetic circuits are meant to be the building blocks of a bigger invention such as an alarm, rover, or windmill. 4. Coding board games - We have enjoyed playing Robot Turtles for years as an introduction to coding logic, and now there is another great coding game on the market called Coder Bunnyz. These make lasting memories for the whole family! 5. Merge Cube - This cube can transform into an augmented reality learning and playing experience unlike any other! Use just the Merge Cube and apps on your smart device or up the game with the Merge Cube VR Headset. 1. Makey-Makey- If you haven't already discovered Makey Makey, stop everything and watch this video! These cheap little circuit boards bring together coding, invention, creativity, and electronics. Just plug into any computer, and with no software download required, watch as your students turn conductive items (PlayDoh, oranges) into a video game controller! We love using these with from elementary all the way to high school! 2. Sphero Bolt Robot- Our favorite robot can’t be beat— it is the Sphero Bolt (read about it in our post here- http://www.vivifystem.com/blog/spheroboltreview)and it has many awesome features that can also grow with your child and be used at home or in the classroom. 3. Video Game Builder Kit - Do your kids love video games? Add to the challenge and increase the learning experience by having them create their own video games using Bloxels Video Game Builder Kit. 4. LED Circuit Stickers- Use Chibi LED Circuit Stickers to make your own electronic creations such as greeting cards and more! 5. Subscription Boxes- Learn about and create your own mini trebuchet or even a hydraulic claw with the Tinker Crate subscription boxes from Kiwi Co. that are perfect for ages 9-16+. Give the gift that keeps giving a new box of excitement every month or pick and choose one of their many boxes to send to your young engineer. 6. STEM Posters - Don’t neglect to grab some cool science swag for their bedroom like this Solar System Poster for an aspiring astronaut. Or how about a patent blueprint of their favorite toys like the lego brick! 7. Telescope - What a better way to inspire and develope a love of STEM than to give the gift of space up close with a beginner telescope. We like this Emarth Telescope for its portability and crisp views. 1. Model Rocket kit- Give the gift that will literally be a blast with model rockets! I spend a lot of time around other Aerospace Engineers and I hear over and over again how their career courses were set after their first launch of a model rocket like this Estes Alpha III rocket. 2. 3D Printer - We love the Flashforge 3D printer and all of its applications for makers! You can even create your own model rocket to launch using the free print files and curricula from gorocketed.com (see our interview with the founder of this company here). For a less expensive printer option, the XYZPrinting da Vinci Jr does a fine job too. 3. 3D Doodle Pen - If you don’t have a 3D printer, you can still create in 3D with 3D doodle pens. For an excellent pen that comes with a set of filaments we like this 3Doodler 3D doodle pen. If you are looking for a budget friendly version, this 3D Pen from Tipeye is a great buy too. 4. Quad copter with a camera! - Experience flight with this Quad Copter from SYMA that can take you to new heights and levels of discovery using its onboard camera. 5. Build Your Own Bluetooth Headphones - As if Bose headphones weren’t cool and desirable enough, they now make a kit where you can truly appreciate the interworkings of the headphones by custom building them yourself with this Build Bose Headphone kit. 6. Board Games - Have you made it out of an escape room? Now you can bring the escape room home with this Escape Room Game from Spin Master Games. Increase those problem solving skills within thrilling themes of the escape room games. 1. Apparel - We are loving www.SvahaUSA.com and their STEM gear that ranges from a Chemistry Lab Equipment Dress to a Constellations Silk Tie. With sales happening all the time and a rewards program for subscribers, you will be Mrs. or Mr. Frizzle in no time! Oh, and did I mention that their dresses have pockets? FOR REAL! 2. 3D Puzzle Engineering Toys - Toys aren’t just for kids. The mechanically inclined adult will have fun building and tinkering with 3D engineering puzzles like these from Robotime. Build a Zepplin or Water Wheel coaster for hours of entertainment that can also be a great gift for a parent and older child to complete together! 3. Books - Send your friend, loved one, or coworker on a journey through science at the fraction of the cost of a plane ticket with some of the greatest science books ever written. Geek Wrapped has done the research for you and compiled a list of their top 50 for you to choose from here. 4. STEM Patent Posters - These are a really cool way to step up the cool geek game. We sport the Wright Flyer and Harley Davidson patents in my home, but I have my eye on these awesome NASA space craft posters as well! 5. 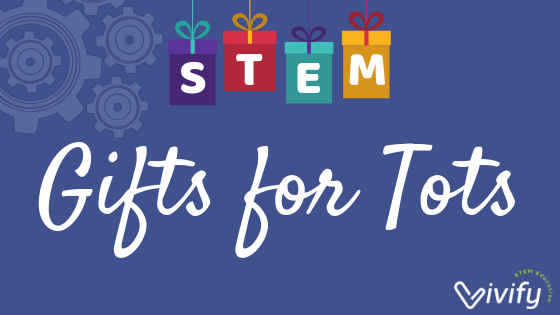 Funny Mugs - Grab a hilariously geeky STEM mugs and fill it with a hot chocolate pouch or a Starbucks gift card and you have the perfect gift! We love this Never Trust an Atom one, or this math symbol I Ate Some Pie one. Want some gifts that keep on giving? Sign up for our newsletter on the top right hand side of this page to receive access to our subscriber-only free resource library filled with tons of free STEM resources that we are continuously growing. 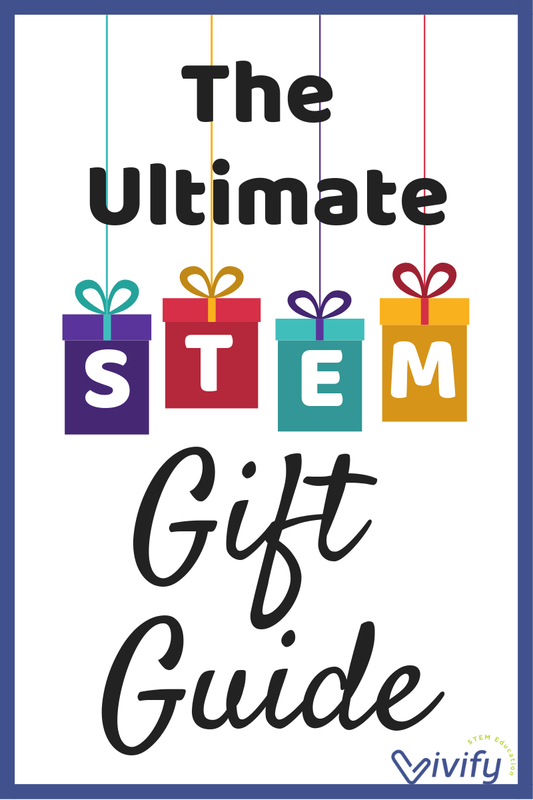 Also, if you are looking for a budget friendly gift for your students or friends’ kids, checkout our Winter STEM Calendar that is loaded with STEM activities for every week day during the winter holiday! This calendar includes STEM activities for each weekday all winter break long! Happy Holidays and Happy STEM Shopping! **Vivify is a participant in the Amazon Services LLC Associates Program, an affiliate advertising program designed to provide a means for us to earn fees by linking to Amazon.com and affiliated sites. This post contains affiliate links.